When Vilachack served a tour in Qatar, he found time to take the weight room seriously. Follow his training program and see how he won our 2011 Military Challenge! To really get your body into peak physical condition, you almost have to separate yourself from reality. You drift into an alternative life of gym and kitchen, of sweat and rest. To get there, bodybuilders need intense inward focus. So for Vilachack Ladara, when the time came for the military challenge, it actually worked to his advantage that he was stationed in Qatar, half the world away from his family and the normal hectic life in America. His regular schedule was replaced by the rigid, long shifts of military duty, accompanied by long shifts of free time. He used his time wisely, and completely re-shaped his body. Vilachack lifts on a 5-day split: chest, back, shoulders, arms, legs. Then he rests and repeats it. That's it—just one body group on each day, giving each muscle group at least 4 days of rest. 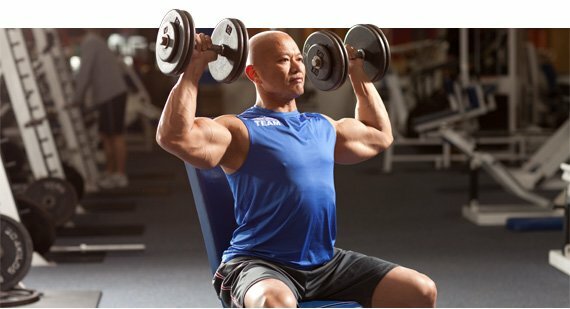 He works compound movements in straight sets to failure. Unless he needs to shock his body. Then he includes dropsets, supersets, rest pauses and any other artillery he needs to deploy. He took fewer rest days on deployment than at home. Back home, rest days are reserved for family time. They take hikes on the beach, or he'll take the dog for a walk. Lately he's been taking runs with his teenage son. He'll do cardio 3-to-5 times per week: cycling, jogging or running. In contrast, when he was preparing for the military challenge, he was running almost daily on a treadmill for 30-to-45 minutes. His intensity never wanes. To help, he's never alone in the gym. "Music is a must," Ladara said. "I put in the iPod and crank it up loud in the gym. I'm there to work out and my time is limited, so when I am there, I try to take advantage of it." Vilachack digs hip-hop, metal, bands like Avenged Sevenfold and artists like Rick Ross—anything to get him fired up. "I like to train as much as I can. I try to set aside at least 1 hour per day to work out. I don't tie myself down with having to train a body part on a specific day. 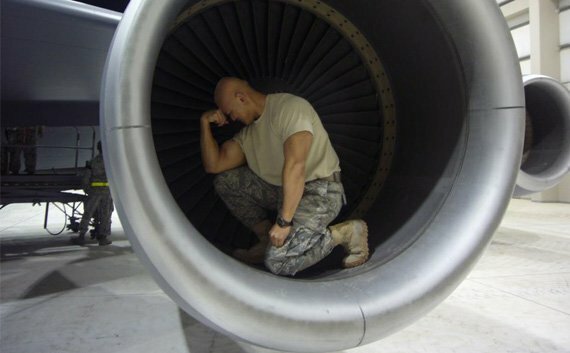 "Flexibility is the key to AIR POWER. I train abs and calves about 3 times per week and will include them with my larger body parts depending on how much time I have. My program is usually straight sets, with pyramiding up with the weights. I do about 4-5 exercises per body part with about 4 working sets each. I make sure I ease into it and warm-up properly. I incorporate HIIT, usually in the last set of the exercise. I do a dropset or rest-pause to fully engage all of the muscle. "Some days it's not always possible to get in the gym, but I improvise by taking my kids out for a bike ride while I jog around the neighborhood or I'll take the dog out for a run. I easily justify it because it's spending quality time with my children while still exercising and instilling fitness in their lives." Do these last, after fatigue, to keep from going too heavy and also to prevent injury.